Our house sprung a leak. We don’t know when it happened because it’s somewhat of a slow leak, but when Jeremy discovered it Friday night in the ceiling of our ground floor, it had soaked four shelves’ worth of backpacking, ski, and mountaineering gear, as well as drywall. We pitched tents, spread out sleeping bags, poured water from boots, unraveled ropes, removed crampons and bindings from sopping wet boxes. This gear is meant to get wet, after all. Jeremy isolated the cause of the leak and our plumber is coming on Monday. …or sitting down to a bowl of beef noodle soup after ski touring the backcountry with your sweetheart. I’m not talking about western beef noodle soup. That’s not even on my radar. No, I am referring to the ultimate beef noodle soup – Taiwanese beef noodle soup. This is the noodle soup of my people. I’ve had a variety of homemade and restaurant versions of this beloved soup. 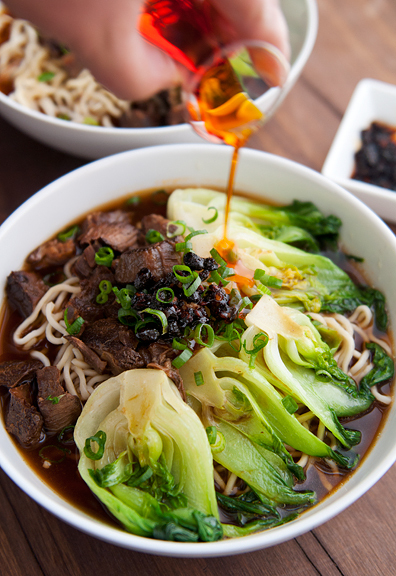 I’ve flipped through many recipes and never found one that really called to me, until the other day when Carolyn posted a link to Chef Hou Chun-sheng’s winning spicy beef noodle soup recipe. Winning, because Chef Hou dusted his competitors at the Taipei International Beef Noodle Festival in 2011. I had most of the spices, but for those in short supply or those I didn’t have, I knew where to go. Savory Spice Shop in Boulder always has what I’m looking for. However, there were two items that I think are pretty specific to Chinese herbal medicine stores: the cassia buds and the angelica root. They didn’t have them (although they looked them up and told me what they were) and I decided it wasn’t worth the scavenger hunt at the Asian markets. My parents hadn’t heard of those either and my dad suggested I omit them. I don’t know if this is kosher or not, but I dried my own organic orange peel. I got beef marrow bones because the butcher said it would lend a deeper flavor to the broth. This soup is ALL about the broth. It costs more, but I am convinced it is worth it. As for beef shank, I rarely find whole beef shank anywhere but in the Asian markets, so I picked up a few pounds of the bone-in cut beef shank. 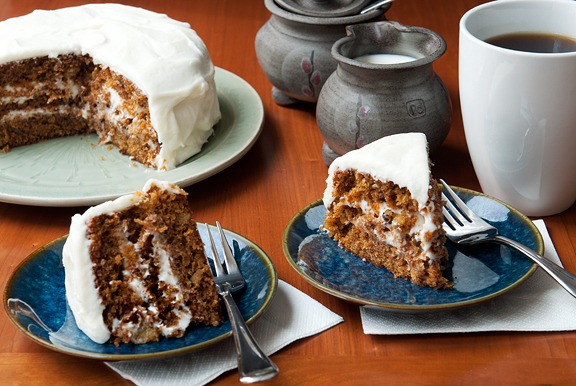 Now, you can make this in one longish day or you can make this over the course of two days. It really depends on a couple of factors: 1) if you use a conventional stock pot or if you use a pressure cooker and 2) if you defat the broth and sauce (at all, the quick way, or the slow way). Personally, I feel the pressure cooker is the better choice because it is so much faster, more energy efficient, and achieves a tenderness in the beef that is effortless. Physics. It is totally your BFF. The stock can either simmer for 6 hours in the stock pot, or go 30 minutes in the pressure cooker (and then another 30 minutes on natural decompression). Six hours versus one hour? Did I ever mention how much I love my pressure cooker? Regardless of which method you choose, when you first boil the bones in water, you need to skim off the scum that surfaces for the first ten or fifteen minutes. The beef stock is part 1. Now on to part 2, which is the beef sauce. You will need another pot if your beef stock is cooking on the stove. If you can, use a pressure cooker. I don’t have two (yet), but if I did, I would have done this in my second pressure cooker. The beef shanks are boiled in water until they are cooked through. 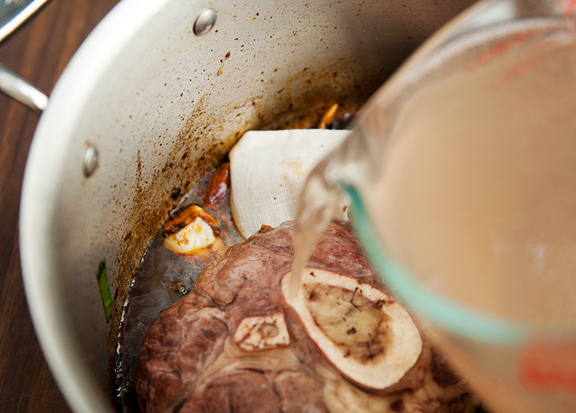 Remove the shanks and strain the beef water into another vessel. Don’t throw the beef water out – it’s got flavor. I think if I had found whole shanks, I might not need to have strained the water. Because I had bone-in shanks, I wanted to remove any potential bone bits and junk from the beef water by straining it through a fine-mesh sieve (you will use the sieve a lot for this recipe). 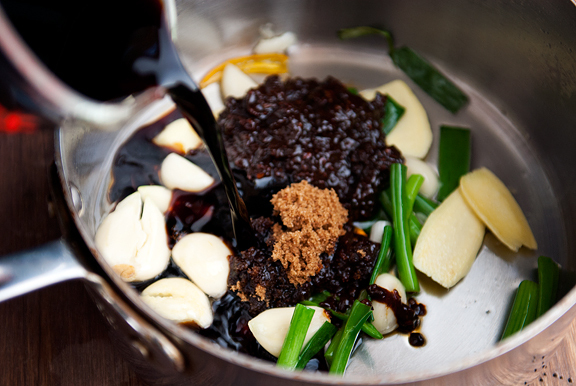 Wipe the pot down and sauté the remaining half of the aromatics just like you did for the beef broth, then add the sugar, hot bean paste, and soy sauce. The recipe calls for adding just enough beef water, but I added all of it. Also, before I started blogging, I never knew there was anything other than soy sauce. Now I know there is soy paste, soy sauce, dark soy sauce, light soy sauce, thick soy sauce… And they are all in my cupboard and refrigerator. Right, so you let the beef simmer for 30 minutes or another 2 hours if you want it tender. Take it from me – you want it tender. There is something quite magical when meat reaches that “falling off the bone” tenderness stage. Barbecue aficionados know of what I speak. I waited for my pressure cooker to finish its first job (the broth) before putting it to work on the beef. I set it on high for 30 minutes with a natural decompression (another 30 minutes). I defat all of my homemade broths. My mom always does this and I think the end product is healthier. Maybe it’s just habit, but I think it is a good one. It does requires a few extra steps. The photo above shows how you defat by chilling the broth (I put it on my deck which was reading 10°F) and skimming off the solidified fat. Another favorite method which is much faster is the ziploc bag trick where you pour hot broth into a giant ziploc, seal it, then pierce a hole at the bottom corner and drain the broth into a vessel, pinching the corner shut right as the fat layer reaches it. I give more detailed instructions in the recipe below. It’s good. It is so good! I made mine spicy, because that’s what Chinese people do. Jeremy had his “plain” and gave it a happy nod of approval, his smile barely keeping in the mouthful of noodles. My parents had expressed their doubts over the phone, but they were equally curious as to how it would turn out. It’s rare that I will actually stamp my feet with joy when I sit down to eat, but this is one happy-making bowl of Taiwanese beef noodle soup. Equipment: Either way, you’re going to be washing a lot of dishes. You will need: a large stock pot or pressure cooker – two is preferable if you’re into multi-tasking (which I am), a medium saucepan, a mesh skimmer, a fine-mesh sieve, and two cloth spice bags. 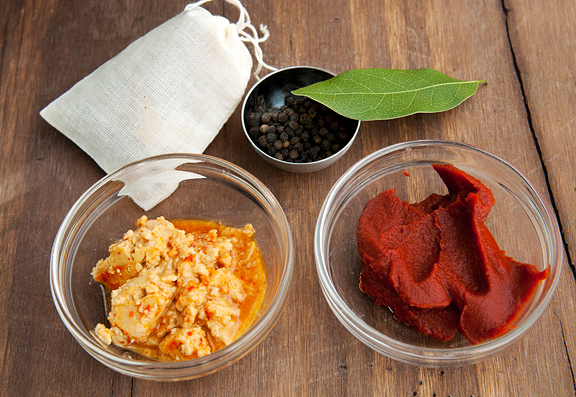 Chinese herb bags: [You don’t have to use herb bags if you plan on straining your broth and sauce.] 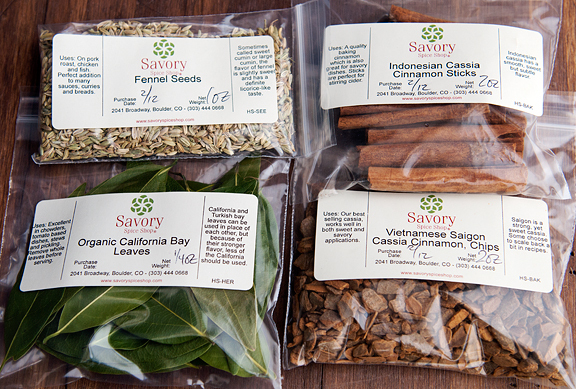 Split all of the herb bag ingredients in half and place the halves in two separate spice bags. 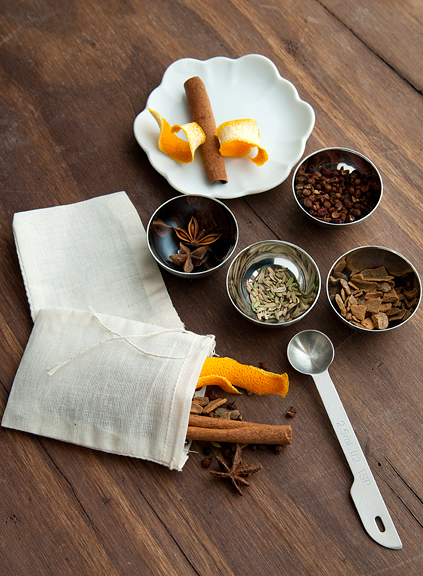 Each bag should contain approximately: 1 whole star anise, 1/2 teaspoon fennel seeds, 1 gram angelica roots (I omitted because I couldn’t find this), 2 pieces of dried orange peel, 1/2 tablespoon Sichuan peppercorns, 3 g cassia buds (I omitted because I couldn’t find this), 1/2 tablespoon cinnamon bark, and one 3-inch cinnamon stick. Tie the bags off. 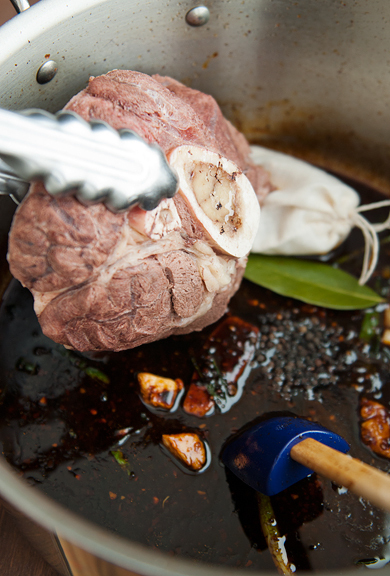 Make the beef broth: Place the beef bones and a gallon of water in a large stock pot or the pot of pressure cooker. Bring the water to a boil and skim off the scum that accumulates on the surface for about 10-15 minutes or until the scum production reduces considerably. Let it continue to boil gently while you work on the aromatics. In a medium saucepan, heat 2 tablespoons of the vegetable oil and sauté half of the: green onions, ginger, garlic, and Thai bird chiles until fragrant. Then add half of the: sugar, hot bean paste, and soy sauce. Let it all simmer for a minute and then pour the contents into the beef broth. Stir half of the fermented bean curd and all of the tomato paste into the broth. Add half of the black peppercorns, one bay leaf, and one bag of Chinese seasonings to the broth. 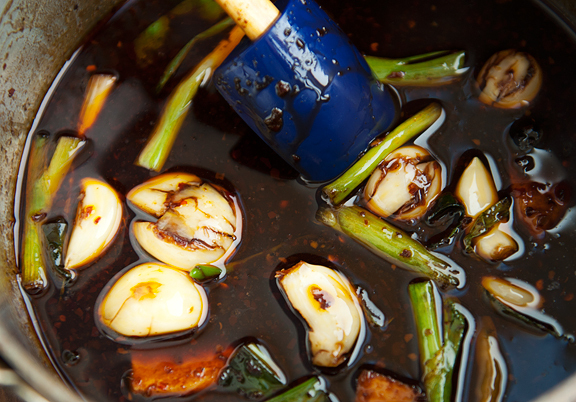 If cooking with a conventional stock pot, simmer the broth for 6 hours. If cooking with a pressure cooker, I let it cook on high (Fagor setting 2) for 30 minutes and natural decompression. Strain the broth with a sieve. Discard the solids. Cook the beef shank and make the beef sauce: Place the beef shank in a pot or saucepan and fill with enough water to just cover the beef. Boil the beef shank until the meat is cooked through. If using whole shanks, remove the beef from the water and slice into disks about 1 1/2 inches in thickness (Chef Hou says 1/3-inch thick, but I like the beef thicker). 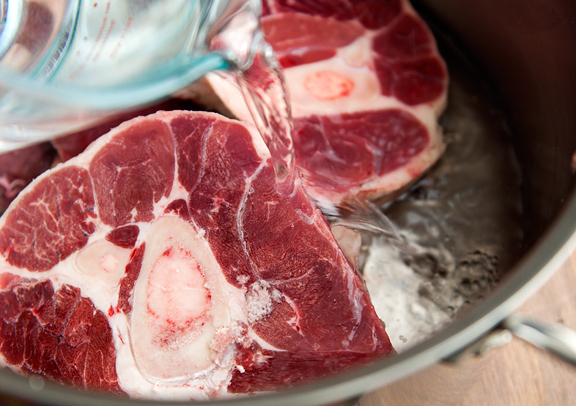 If using beef shank cuts, just remove from the water and set aside. Save the beef water. 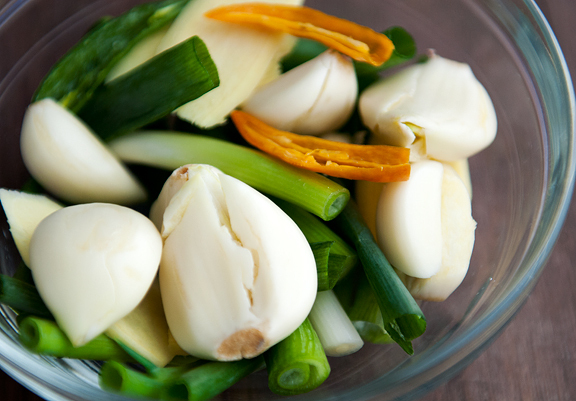 In a large saucepan, stock pot, or pressure cooker pot, heat 2 tablespoons of vegetable oil and sauté the remaining green onions, ginger, garlic, and Thai bird chiles until fragrant. Add the rest of the sugar, hot bean paste, and soy sauce. Let cook for a minute. 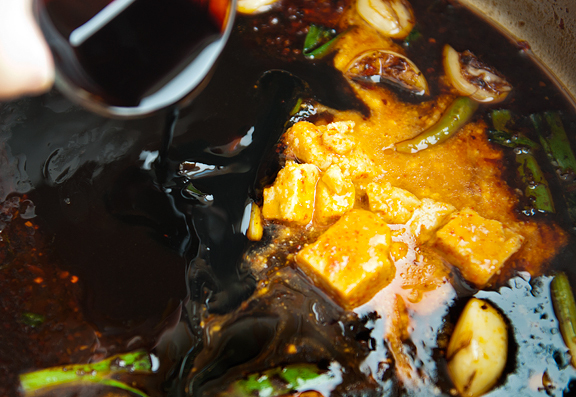 Stir in the remaining fermented bean curd, all of the soy paste, and all of the dark soy sauce. Lastly, add the rest of the black peppercorns, one bay leaf, and the other Chinese herb bag. Place the beef in the stock pot or pressure cooker containing the sauce. Add all of the beef water and stir to make sure it mixes with the sauce. If cooking with a conventional stock pot or saucepan, cover with lid and simmer for at least 30 minutes. If you want the meat to be tender, let it cook for another couple of hours, but check on the water levels to make sure they don’t get too low. If cooking with a pressure cooker, your only option is tender meat. Again, I let mine cook on high (Fagor setting 2) for 30 minutes with natural decompression. 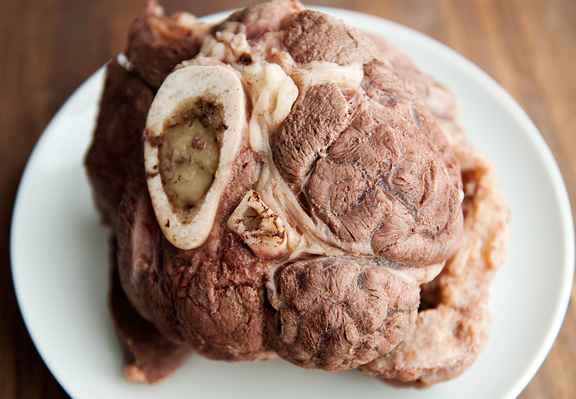 If using bone-in shank, the meat should fall off the bone when it is done. While the beef is warm, I like to discard any fat or connective tissue from the meat, reserving the lean beef in a separate vessel. Strain the sauce through a sieve and discard the solids. Follow the defatting process as listed above for the beef broth if desired. Assembly: Bring fresh water to a boil and cook your noodles (fresh or dried). Drain the noodles and let cool. 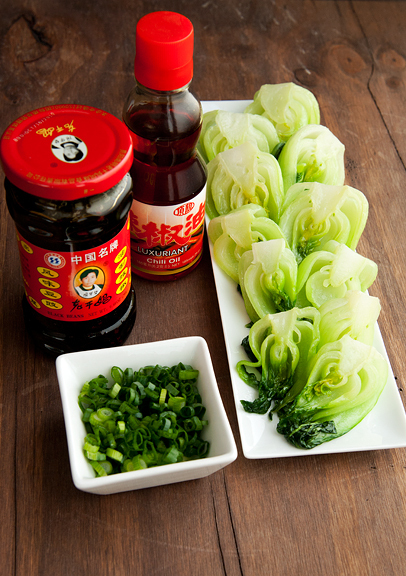 Blanch or sauté baby bok choy and set aside. 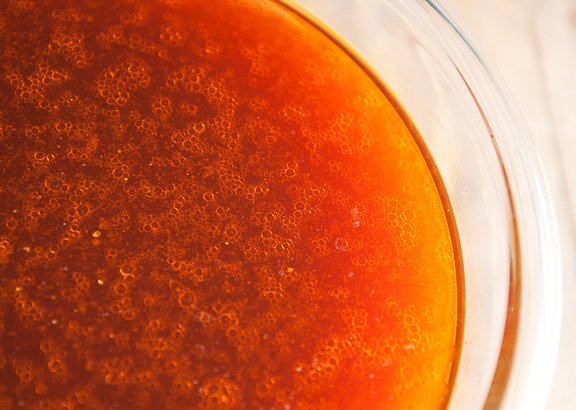 Combine 4 parts beef broth with 1 part beef sauce in a saucepan. Add beef to the broth and bring to a boil. Remove from heat. 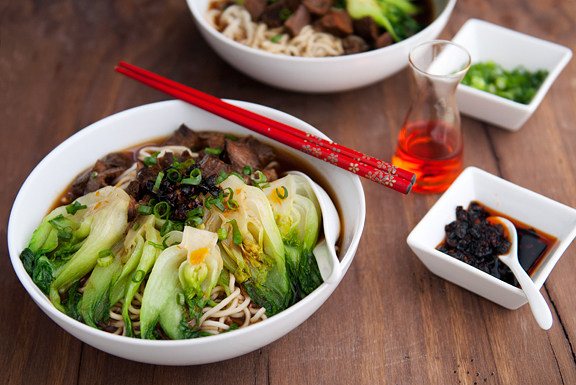 Place noodles in a bowl and top with beef shank, bok choy, and chopped green onions. Ladle the broth-sauce over the noodles. Drizzle some hot chili oil over top (purely optional, but mandatory in my book) and serve with more hot chili sauce on the side. Serves 10-12. Makes about 10 cups of broth and 8 cups of sauce. THANK YOU! I’ve been searching high and low for a recipe for TBN for maybe a year now? I can’t wait to try your recipe!!! THANK YOU!!!!! This looks so good I can’t even believe it. I read so many food blogs that I don’t really salivate while looking at them much anymore — but this has completely obliterated that! Your asian recipes are always my absolute favorites, especially anything Chinese/Taiwanese. This recipe has about 20 ingredients I don’t have/don’t know how to acquire, but I shall make it my goal to one day tackle it. Any plans to open a beef noodle stall? Flying to Colorado would be far easier for me than flying all the way to Taiwan! Say NO to drama! I want to tattoo that on my eyelids! Especially OTHER people’s drama. The soup looks like a delicious labor of love. Wish I could smell it this snowy, cold morning. This looks amazing! It reminds me that I need to get (and write down) my mom’s version of Taiwanese beef noodle soup. She always gets rave props for hers! Looooove the soup. Love even more the “I “should” be upset, but I’m not moments. You rock. You never mentioned though, what you did with your marrow. Myself I would have put it back into the soup, and heated until melted. It makes a great and natural thickener. If I didn”t do that I would have put it on toast and salted it, and enjoyed! Amazing. I have to go to Savory now. I have to make this..or at least start the process. I love the photos showing each steps. Just wonderful! all those steps and then that first bite of the finished soup–priceless I bet. well worth the effort. I bet this soup made you feel so good. Oh, man… I love niu rou mien. Indeed, the ultimate comfort food. I’m definitely taking a crack at this soon! And amen on not getting sucked into your own drama. I often remind myself that freaking out solves nothing. I don’t always listen to myself, but it’s a work in progress. Thank you thank you thank you. Like mom used to make. THIS MAKES ME SO HAPPY!!!! I went to Taiwan last summer (to learn a seismology modeling program!) and I miss, miss, miss the food. I can’t wait to try this recipe out! Glad you didn’t succumb to house-leaking drama and it is indeed all about the broth! Drama is soooo boring! This noodle dish, however, is not…. This looks so tasty. Look forward to trying it! Oh my word. All the steps to making the broth, so worth it. That’s what makes it good. Could you let me know which brand or model of pressure cooker you’re using? I haven’t bought mine yet and was wondering whether you had any recommendations. question, how the heck did you get such good looking pictures of the broth making??? i recently made duck broth, and my photos look SO gross. well…. my pictures compared to yours is unfair in general, i picked up a camera yesterday. but serious, broth is not pretty to look at, and somehow i’m still salivating over your photos. This is a BIG recipe! I’m sure you know what I mean. Gotta find some time to do this the proper way. But soy paste? I have never ever seen it before! Your site is seriously my go to place to find the amazing Chinese recipes from my childhood. I am now busy rescheduling my weekend around this dish. Thank you! Goodness…this is an amazing post. Soup looks fantastic. 1) God, I hate drama! Seriously, what’s the point? If we all just cook and eat together, we can be friends. 2) I need to buy some dark soy sauce. Every time I’m in the Chinese market, I pass right by it. That needs to stop. 3) That’s it, you’ve convinced me. A pressure cooker is going to be purchased by the end of this month. 4) You make some awesome food and take some gorgeous photos, Jen. I realize I’m stating the obvious, but thought it needed to be said once again. This is one really tasty looking and sounding soup! When I first read this I was sad because I really, really want this soup but didn’t think it would happen with 4 kids running around while trying to make it. Then I realized, that’s what husbands are for and I can totally make this next weekend while I send them to the park! Yeah me! 2. i don’t care if this takes me 2/3 days to make, it’ll happen! my only question is what noodles would i buy and can i get them at whole foods? 3. righteous recipe for a chilly night! Not just a humble bowl of beef noodles it seems. So complicated but I’m sure it’s all worth it. It’s hard to find beef noodles this quality in Malaysia…..
You know, I usually am up on my Asian condiments, but I don’t think I’ve ever seen soy paste before! And I have ground bean sauce (plus chili ground bean sauce!) hanging in my fridge. I have failed, obviously. No matter, I need this soup in my life, so I will have to seek it out! Holy cow that looks amazing! I’m a total asian food junkie, and I want this….like right now! It looks like it would be super-expensive to make….but it would feed a crowd. (or just me, for a long time!) Thanks for posting it with such great detail. I will be slowly gathering up the ingrediants so I can make this. The pictures look amazing! It is making me crave authentic asian food as I am studying away for my orgo exam. Being in Cornell really limits my food options haha. How did you like your time in Ithaca? wow- this is stunning! looks so fresh, healthy, and rich. 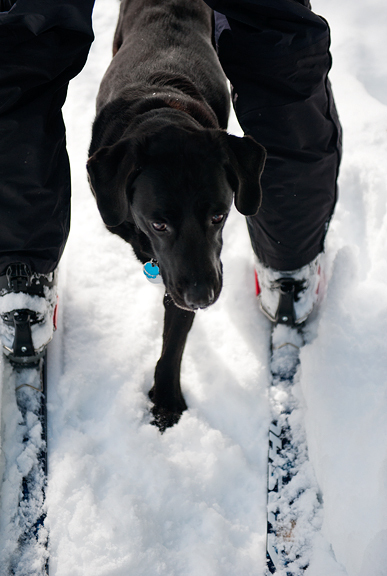 a rare combo… saving this one to try out soon- before winter ends! hey jen: forget my question re: noodles. i did spend my morning in an asian market (it was fun and frustrating all at the same time!–i.e., white girl goes in and wonders which noodles to get b/c there is a whole aisle of them and can’t figure it out)…OK! i’m going back soon–it was a great market! swan – it should be fine! Both chili oils look very delicious! I personally add copious amounts of chili oil to my beef soup bowl just for its heat. Did you make them or are they store bought? I have tried buying “chili oils” at the grocery store like Lee Kum Kee but it is overwhelming with salt/vinegar. I like spicy not salty! Any tips on buying/making chili oils would be greatly appreciated ! This is so lovely! I have grown up eating it, but have never attempted making one. The steps you took here made it such a work of art. I love your photography too – what are the specs and how did you light them so perfectly?! Hey everyone, I realize it’s a long list of ingredients and that some may be hard to find. 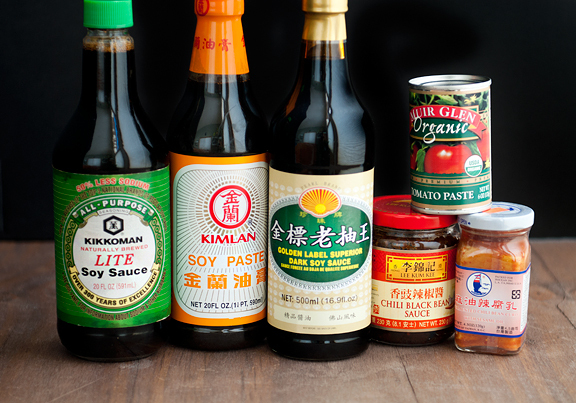 First and foremost, go to an Asian grocery store to find the chili bean paste and the soy paste and dark soy sauce, fermented bean curd, etc. If you can’t find the cassia bark, omit it. If you can’t find angelica roots or cassia buds, don’t worry – I couldn’t either. Just try to make sure you get star anise for sure and all of the stuff under “aromatics and such” as well as the beef (that’s kinda key). 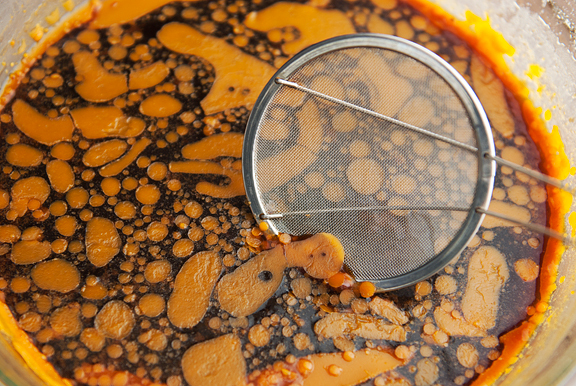 Charlie – I think it mostly disintegrated into the broth. vanillasugarblog – it was wonderful! Marie – good on ya. Jasmine – I have only used one, my Fagor Duo (8 liter). I love it. But there are many other models and brands. Shop around. Just make sure you get a quality one because safety is kinda important! Lannie – I dunno… I think broth-making is beautiful, so I try to capture what I think looks good? Mrs. Ergül – I never used it before so never thought to look for it until now. Vicky – omg, you live in DC – you have a Chinatown! Go forth and rummage through the Asian grocery stores! Gwen – awww, I hope you find a chance to make it! swan – I’d probably go to an Asian grocery store over Whole Foods. There will be a huge selection and possibly fresh noodles too. hanna – I buy my chili oil. The one in the photo is straight chili oil – no salt or vinegar. Oh. My. I cannot wait to try out this recipe! After a trip to Taiwan, I’ve been suffering from a bad craving of a hearty bowl of Taiwanese beef noodle soup. I’m trying to recreate some dumplings, too. Then my Taiwanese meal will be complete – oh wait, I can’t forget the winter melon drink! Thanks for the inspiration. I have a restaurant and I’m really interested in testing this out and serving this at my place. One question, exactly how much water should be left after the beef shanks have been cooking in the soy sauce, herb, beef broth mixture? This part is a little confusing, because too much water will cause the sauce to be weak and too little will cause it to be salty. Could you tell me how much of this beef sauce it should yield? Pete – in the recipe, it states a yield of 8 cups of sauce, 10 cups of broth. J – yes, you can make it up to 3 days in advance and keep it in the refrigerator. Or – you can even freeze them for up to a month? I’ve been staring at this recipe since March but I’ve been too afraid to try it out of fear of screwing up… Finally mustered up the courage to make this and I have never been more proud of myself! I shared it with my Grandma and a bunch of my uncles and aunties at Sunday dinner and everyone loved it lots =D Now we have a huge container of frozen broth and sauce in our freezer saved for some random day when no one wants to cook ahaha… Thanks for sharing the recipe! Rachel – that is so awesome!! It tasted just fantastic, I actually found it much more tasty than most of what I had tried in Taiwan and China. I absolutely love how thorough and detailed your instructions are. And your pictures are not only helpful, they’re artistic!! 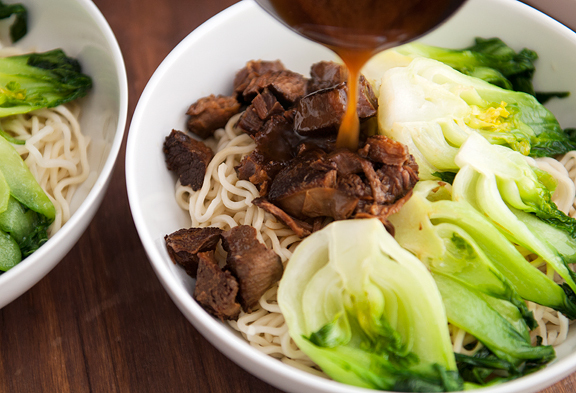 I have been craving Taiwanese beef noodle soup for days now, and your recipe has convinced me to give it a try. I’ve actually been scouring the Internets for this and yours looks the tastiest by far. Just ordered a 16 quart stock pot from Amazon and will devote this weekend to making it. So excited! Thank you!!! Omg! 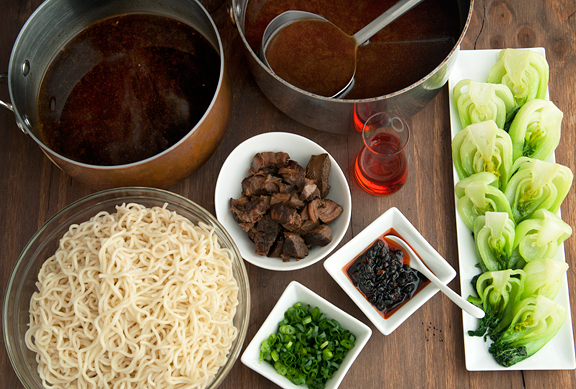 I just made some beef noodle soup but it didn’t turn out as I had hoped :( your recipe is next on my list to try!. Just wondering what do u do with the beef sauce u didn’t mention it in ur happy bowl? And also wondering why you didn’t just put the shank in the same broth to cook? Lisa – the sauce is mentioned in the Assembly section. And I didn’t put the shank in the broth because I’m following the recipe as it was listed. Jen, those baby bok choy are so beautiful. I love this recipe. It is absolutely gorgeous. Wow. I’ve been searching for satisfying beef noodle soup recipe for years. After trying this one, I finally found one that can end my relentless search. One question: Since most of the same ingredients are in the sauce and the broth, could this recipe be done with just one stock/sauce mixed together? Wendy – I’m sure you could make it any way you like, it’s all a matter of preference. I think the sauce is more concentrated and certainly lends a stronger flavor than the broth alone. Hey there! really like this blog post of yours. After reading this post, I immediately went and brought the ingredient to start my experiment. Black bean blend of some sort. The Lee Kum Kee brand you use will be fine. Dark or light rice sherry wine. Darkened soy sauce – This type is generally not salty, it is there just to add color and aroma. Just a little bit of dark rock sugar. Tallow (rendered beef fat) or lard. Shank, tendon boiled for a little in water then diced to cubes. Sauteed the cubed meat with generous amount of tallow or lard along with dried spice mix, ginger, garlic until the meat and spices turns golden brown. This should be done before adding the liquid seasoning. cook the meat for 2 hours on medium, preferably no additional water added, let the broth stay condensed and salty, turn off fire and let the meat soak for a couple of hours or overnight. Make sure to not overcook the meat, doing so will cause the meat to break apart and become sinewy. Making your own noodle usually taste better but any fresh made wide flour noodle from the store will go great with it. Add one ladle, or desired amount of thick broth and meat with the cooked noodle, dilute with hot water and garnish with toppings. Additional fresh hot bean paste and white vinegar could be added to taste as an option. Thank you for this recipe =) ~! I’m Korean but married to a Chinese guy, and not familiar with cooking Chinese cuisine. How does one learn the taste of what Chinese food should taste like when one grows up in a Korean household? Websites like yours and RasaMalaysia! My husband really enjoyed this Taiwanese soup. By the way, if you cook the beef shank bones + beef shank + onions/garlic/green onions for 7 hours, it becomes a Korean soup dish called Seolleongtang. You can make two different soups for one set of ingredients if you use two pots and divide it along the way…then save one soup for another day by putting it in the freezer. I almost forgot! What kind of noodles do you use to make yours? It’s funny that you mention dragging him to the store and having him pick! I actually tried to get him to pick noodles at grocery stores in Chinatown, but he shook his head and wanted me to pick. The extent of his culinary expertise is cooking instant noodles, so he doesn’t know much, lol! Thanks for the tip! We’ll try one of those next time!! I have a question about the scum that is produced from the beef broth. The bone that I used produced a green scum. This made me nervous and feel like I bought and used a bad bone since all every time I’ve made this in the past, my scum has been brown. Needless to say, I halted my cooking and through out the bone and water. I was wondering what causes the green scum… Was it a bad bone? Or is that normal? Thanks! I just don’t want to serve something that would be inferior in taste, or even worse, make me and my loved ones sick! Stacey – I googled it and it seems that it occurs on occasion, but every person who got green scum ended up throwing it all out. I wonder if the beef was bad? Someone suggested that there was bacteria in the bones. Either way, I don’t think it is normal and definitely be safe than sorry. Best of luck on the next batch. Thanks so much for the recipe, it was delicious and made me feel like I was back in the streets of Tainan, Taiwan again! 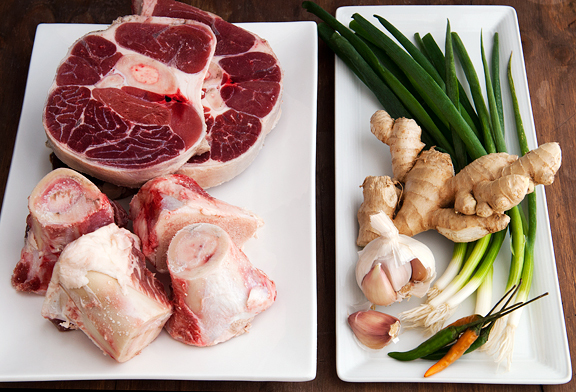 What do you think about combining all the ingredients towards the making of the beef broth rather than dealing with the beef sauce extra step? I’m trying to understand why making the beef sauce and dividing half the ingredients are necessary when it’s all going to the same place, does it give better flavor? I may try both ways in the future. Thank you! where do you buy the bag to put all the herb in it? 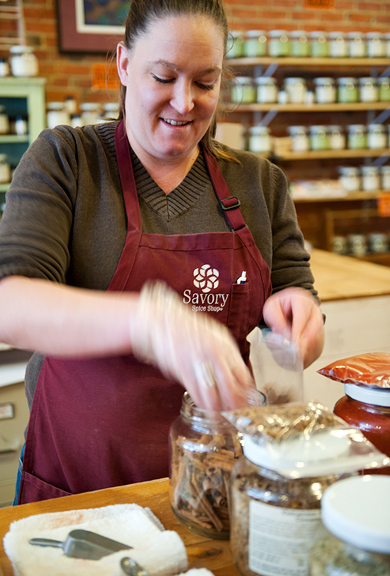 Christy – you can find them in most cookware stores or Target or grocery stores (they are herb bags). You can also easily make your own by taking a square of cheesecloth (several layers) and wrapping it around the herbs like a pouch and tying it off with some string. I made this per the posted recipe instructions. I did use the cassia buds in my version. And the cassia buds were one of the things wrong with this recipe I would change. There is WAY too much cinnamon in this soup, and adding in both cassia buds and bark to it just brings it over the top. The bark, in particular, adds a gritty dimension to it that was too much for me. I understand what the soup is shooting for, I just think it overshoots it. 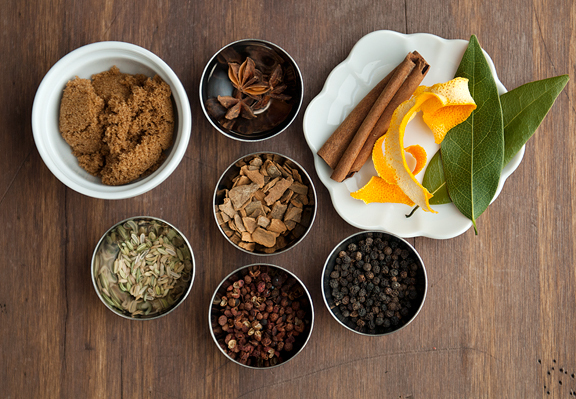 Reduce the cinnamon across the board by half, and up the heat with red pepper flakes. The soup is good, but to be honest, this one is overly complex without the payoff to justify the time and expense. It is also a little too red for my tastes. Next time I will add half a cup of Chinese black “Nooodel” sauce to the base. I also do not see the point of cooking the stock separately from the sauce. The differences are just not significant enough to merit the trouble. 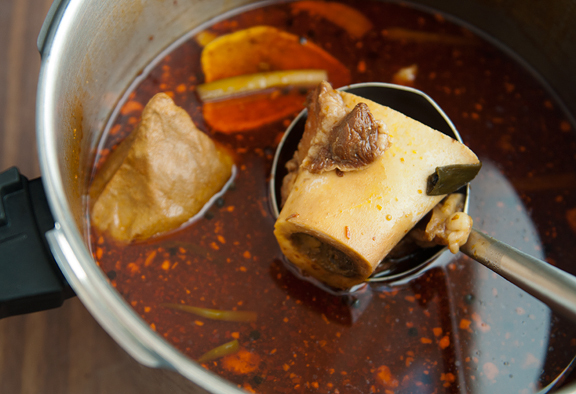 I would prepare the stock as you noted, substituting *chili* fermented bean curd for the bean curd, adding in the soy paste and the dark soy meant for the sauce with the marrow bones and let it all go in the pressure cooker for 35 minutes. After that, I would poach the beef using stew meat. 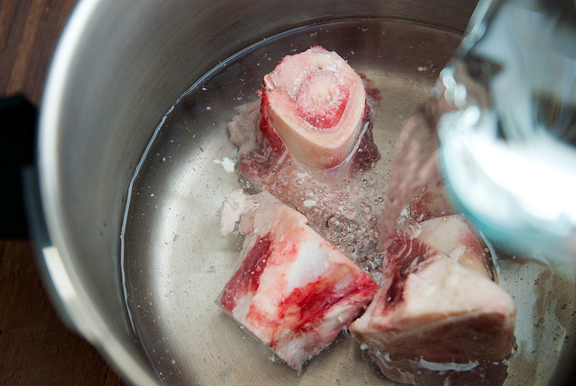 Using the bone in shank beef is unnecessary after you went to the trouble of making the stock with the marrow bones. Instead, I would precook 2 lbs of stew meat in .3/4″ to 1″ cubes in size. Not also does this make the beef more attractive in the bowl, it holds together better while being cooked. I found far too much of the beef shank is lost in the strain. To aid in keeping a preservable amount of this soup (it’s too much to eat once and does not keep well in the fridge), I would prefer to do something heretical that a local restaurant does here: I would simmer that stock until it reduces by at LEAST half, maybe even to a *third* in an open pot with the beef in. 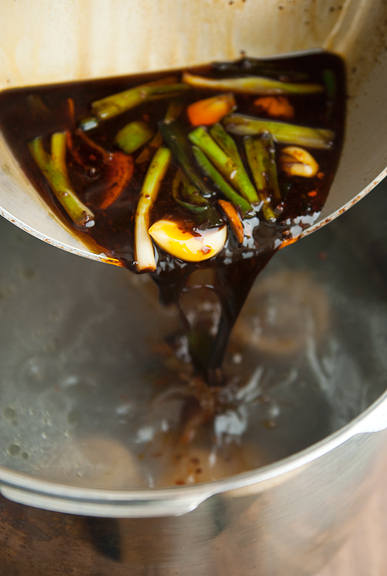 To serve, use vegetable or chicken stock in a 4:1 ratio with the reduced spicy beef noodle stock. The assembled soup will taste better, imo and have a better texture. MERLINI – Je suis désolé, mon français est terrible. peut-être que vous pourriez trouver un ami pour traduire la recette ou utiliser google translate?